You can also get the 9.53 from Victoria (9.59 Clapham Junction), arriving Oxted at 10.31, but if you do this you have to promise not to fraternise with the Saturday Third Walkers who will be on the same train). Buy a day return to Lingfield. For walk directions click here. Unless you intend to do the shorter ending to Oxted (the shorter Edenbridge ending is not advised today due to engineering works) you can shorten the directions to just those you need by clicking "M. Main Walk" just below the map. 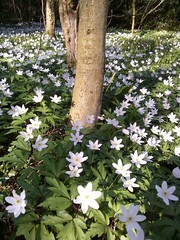 My reason for picking this walk is hopefully to catch the large and extensive Staffhurst Wood in full flower: bluebells and wood anemones (photo) being its star feature. The latter are somewhat fickle creatures, only opening up on warm days. Faute de mieux, there is one bluebell wood earlier in the walk which should definitely be in full flood, since it was already about a third out three weeks ago. The solitary lunch pub on this walk is The Royal Oak Inn, just after Staffhurst Wood, which does have a garden if it is fine. Phoning it from the start of the walk to book a table may not be a bad idea, but if it is the weather is fine note that the pub does have a garden (booked tables tend to be inside). After lunch the route is across low lying fields and soft ground may be an issue here if it has rained a lot in the week. This shouldn't be a problem by this stage in April, but it seems this year it is, a bit: but equally a few dry days can work wonders. Lingfield has a tea room if you can get to it before its 5.30pm close: otherwise it has two pubs. n=20 on this walk - an estimate, as half the group had disappeared before I emerged from the station. But I was told that there were about that many. This walk had an ill-starred beginning, first with all Southern trains out of London Bridge being held up by a problem at East Croydon (though in the end we were only 10-15 minutes late) and then with someone ringing the only lunch pub and being told they would not accommodate us. Fortunately some of us heard this in time to buy provisions at the very excellent Co-op in Oxted (I can recommend the chicken couscous): about half a dozen who did not get the news nevertheless managed to squeeze into the "fully booked" pub, but later arrivals were refused. We all got very spread out early on, so the rest of this account describes my experience. Weather much better than the grim wintry conditions forecast - w=cloudy-and-unseasonably-cold-but-with-some-good-sunny-intervals-in-the-afternoon. While we all got throughly splattered in mud, the low-lying fields on much of this walk were also nothing like was waterlogged as I expected after yesterday's deluge. The other bit of good news was Staffhurst Wood, where the very extensive bluebells were in full flower. Liberated from the need to get to lunch in time, three of us did the longer loop around this, having a veritable bluebell feast. We admired (and climbed inside) the wonderful Crowhurst Yew, saw more bluebells and lambs, heard a chorus of blackbirds, and seven of us finished up at The Star in Lingfield where we had an early dinner (or possibly a very late lunch).